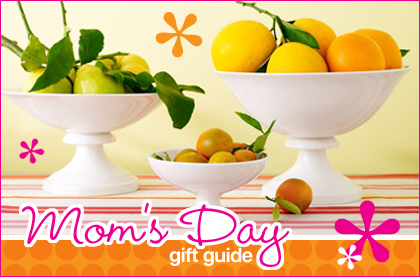 Every year I do a post of gift ideas for Mother’s Day. So in keeping up with that tradition, I wanna start early and share with my readers a few items that I think Moms of all ages would appreciate. What Mother wouldn’t want to be as stylish as the next in this fly Popover Jumpsuit by Ashley Stewart, $49.50. Its sleek and easy to put on and can take you from a day of shopping to a nice walk on the beach which is where the Michael Kors Travel Tote from Macy’s, $328 comes into play. I have to admit, this tote is on my wishlist as we speak. For those summer days when you want to lay back and chill out, this can hold all of your goodies including magazines such as Essence which you’ll get a free one-year subscription to when you order $50 or more from Ashley Stewart. Then once you’ve caught all up on your reading and relaxing, spritz on a little Donna Karan Cashmere Mist, ($105 for the Gift Set from Nordstrom) and enjoy a night on the town. After all, it’s your Mother’s Day celebration so you are free to be you on Sunday, May 12th.